Meet Ashera, the world’s largest, rarest and most exotic domestic cat that costs $22,000. (Yes, that’s 3 zeros after 22.) Lifestyle Pets developed the Ashera cat by blending a breed mixture of the African Serval cat, the Asian Leopard cat, and the domestic cat. The Ashera has leopard-like spots and tiger stripes and can grow up to 30 pounds. They are supposed to be quite intelligent, affectionate, good with children and other pets, and does well on a leash. (For 22 grand, it should also take me to work and back and get 45 miles to the gallon.) There will only be 50 Asheras available in the United States each year and delivery time can take up to 12 months. Sure makes these “toygers” look like a bargain. This entry was posted on Thursday, May 31st, 2007 at 3:53 am	and is filed under Cats, National Dog, Cat & Pet Info, Products & Services for Cats & Dogs. You can follow any responses to this entry through the RSS 2.0 feed. Both comments and pings are currently closed. Personally, this cat does not look to “domesticated” to me. It looks like this cat is thinking “Let me off this leash, you look like a good next meal”. $22,000. Are you crazy? I can adopt a cat or a kitten that will give me unconditional love for years with little cost. And I thought my cat is huge. LOL. I think the ethics of developing “new” breeds of pet animals when literally thousands of cats and dogs are living in shelters waiting for homes are particularly questionable. Scarcity and high price guarantee this animal will become a status symbol for the shallower of the wealthy, acquisitive set; it won’t be about loving cats, but about how rare and expensive this particular breed is. Sorry to get up on a high horse, but this kind of thing irks me. I just placed a order for one, I can’t wait till I get it! Just think how many lives an animal shelter can save with $22,000. I agree with K, it irks me too. Oh well, the people who would buy this cat wouldn’t donate one nickel to a shelter anyway. Fortunately though, with only 50 born per year it’s a drop in the bucket. In general, the whole purebred pet industry really bothers me. I always wonder what health problems are going to pop up years down the road with these ultra-engineered breeds. I saw these cats today on Fox news. I wrote to the Lifstyle Pets people as soon as I got home. …donate any of your profits to the ASPCA, Humane Society or other organizations that help save homeless cats and dogs? I have to ask that because any company or individual that is creating new breeds of cats and dogs when millions of homeless pets are euthanized every year simply for lack of homes SHOULD do something to help lessen the pet overpopulation problem, especially when they are adding to that same problem. There is nothing on your website stating that your company does help homeless pets and that bothers me, even more so when I see that your “Ashera” cat costs in the tens of thousands of dollars for a single kitten, and that you’re also developing a new breed of dog. For the price of one Ashera kitten, hundreds of needy homeless dogs and cats could be saved from certain death. If your company does help shelter pets, I encourage you to state this fact on your website and other advertisements. If not, I would like to ask you to begin doing so. Your company and your clients both are in a position to do a lot of good for suffering animals. The pet overpopulation crisis in America is a shameful, horrible problem that we all have our part in. Whether one purposefully works to help stop it or simply does nothing about it at all, each of us has our share of responsibility. Is that portion of responsibility which belongs to your company in the category of “helping homeless pets” or “not helping”? I do hope I will hear from you with the answer soon. Thank you. We appreciate your concern, which are the same as ours. We are currently looking at a number of options; we will likely choose to contribute to research and development on cat illnesses and diseases so that we can help not just homeless and abandoned cats, but the whole feline population in general. It does make me feel better to know your company may help researchers of feline diseases. That is also a worthy cause. Your new breed of cats is beautiful and I’m sure they will be very popular with the cat fanciers of the world. I have no doubt the creation of this breed and your new dog breed will turn out to be a profitable venture. However one looks at it, though, there is still the fact that each kitten or puppy you sell takes away an opportunity for an abandoned or stray animal to have a forever home. Every breeder is in the same boat, and many of them choose to help offset that by donating to rescues and shelters. I hope Lifestyle Pets will do same. Every little bit helps, and every homeless cat or dog saved is a life that doesn’t get snuffed out. I myself have made a personal vow to never buy from a breeder. Every cat I’ve ever had has come from a shelter or directly off the street. My youngest cat came from an old lady who brought her into the store I work at. She was carrying her in a plastic grocery bag and she told me, “I don’t want this kitten, I want to drop it off here.” I shudder to think about what would have happened to this sweet little kitty if I had not taken her. Likely she would have been thrown away in that bag like trash. I still feel sad that I can’t save more animals than just the ones I take in, but I realize I have a limited ability to help and I hope that by encouraging as many people as possible to help stop the needless deaths of homeless pets I can indirectly save some more. Thanks again for reading my words. I hope they make you decide to save some needy pets too. Naturally, I haven’t heard any more from them. I agree with you 100%, Jackie, their clients probably don’t give a flying fart about homeless pets. I really hoped the company would at least. I’m sure the real reason behind their plans to help fund “research and development on cat illnesses and diseases so that we can help not just homeless and abandoned cats, but the whole feline population in general.” is to improve their breeding programs and bring higher yields from each of their litters more than helping all cats and dogs. bit more than, oh I don’t know……maybe $20,000. That is completely outragous. Sure the cats are horendously beautiful, but, sheesh, why can’t they be sold as a normal cat??? This breed has structure, a well-defined breed standard, carefully thought out breeding programs, a LOT of breeder dialogue through the Savannah Cat Club and the Savannah Breed Section Lists, testing and discussion on health and genetics, and a large international registering body (The International Cat Association - TICA) that documents the pedigrees of each Savannah cat. 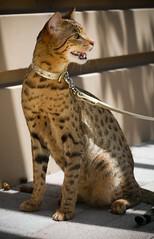 Additionally, Savannah cats are exhibited all of the United States at TICA shows - where the public can meet them up close and personal. The difference between a Savannah and the Ashera? I would say the Savannah can be likened to a well-bred, pedigreed horse or show dog — whose lineage is carefully tracked and whose breeding painstakingly thought out. The Asheera is probably more like a Goldendoodle or a Shitzypoo. Not registered, not shown, no standard — but the whim of a couple of folks who thought wouldn’t it be fun? And folks will pay top dollar for these Mixed Breeds? Curious, isn’t it? Savannah Fan, I’m not aware of anyone PAYING top dollar for that animal. I’m aware that the people are ASKING $22,000 for it. There’s a difference. Well since there is a two year waiting list I would said it is hitting the roof…If anyone is interested I would be more then Happy to Supply them with a Savannah at a 10th of the price of the Ashera. There may be a 2-year waiting list, but I doubt there’s anyone on it. Look, these people are promoting a Savannah cat as a rare and exotic breed developed by them; do you think they’d hesitate to lie about people wanting to buy it? You can get a Savannah that looks similar to this cat from www.stawbell.co.uk. Animal shelters across the country are full of cats and kittens which are killed if not adopted. Most of those cats are absolutely gorgeous. To breed a hybrid and sell them for $22,000 is hubris. If one needs a bragging subject, a fancy car will do. Cats are living creatures who feel fear, anguish, pain, joy etc. They need to be treated with all the respect living things deserve. If anyone wants to brag, a far better way is to get a cat or kitten from a shelter, which costs less than $100., then donate the money saved to the HSUS or Best Friends. For a donation that big they will publish your name, and then you really have something to brag about. Although I see where everyone is coming from (I have 3 cats, all rescue kitties) I don’t think you can judge them harshly for created (or those who want to buy) exotic cats. After all it’s the same philosophy as saying that no one should have children while there are still children to be adopted, or that no one should buy expensive cars just because they have the money to. If you have the money, you are welcome to spend it on whatever you want. It’s their money, and they should be allowed to buy an exotic animal without having to be told that they should have donated the money to random animal shelters all over the world. It’s not their responsibility to take care of the world’s animal overpopulation problem. The real issue is that cats are being forced into shelters in the first place when they are so perfectly equipped to live feral. I used to feed all the neighborhood feral cats every night, and all of them are large, well-fed, happy cats who wouldn’t come back inside unless they are being forced. The animal shelters tend to give them a MUCH worse life than they would have if they were allowed to be feral. I’m planning on buying a Savannah soon, and although I love rescuing kitties from those horrible shelters, my $3000 is MY $3000 and I won’t feel guilty for not spending it on 50 rescued kitties.